June 5, 2015, 9:22 AM · If you visit any of the Disney theme parks or resorts with any regularity, you likely have encountered Disney trading pins. Cast members typically wear them on pin trading lanyards or black totes. Some of the more popular merchandising locations even offer large trays of pins for trading to guests. As popular as pin trading is, a quick search of the Internet reveals that the world of Disney pin trading can be full of controversy. Cheap knockoffs and “scrappers” make up a large number of the pins traded at Disney parks, even by cast members. Scrappers are simply pins that didn’t meet quality assurance standards and have been resold to people looking to buy pins on the cheap. Sometimes, the same molds are used in an unauthorized manner to make the fakes. This makes it really difficult to know if you’re getting the real deal. Fake pins infuriate customers who pay $4 to $14 a pin, only to give away their pins for cheap, worthless knockoffs. Whether you’re an aspiring collector, or, like me, someone who just appreciates nice looking pins of their favorite characters, it’s important to be able to identify a fake. Here are five tips you can use to spot fake pins during your next Disney trip. One of the tell-tale signs that a trading pin is a fake is when the color of the pin is really off. If Princess Tiana from The Princess and the Frog, Disney’s first African-American princess, has pink or yellow skin, this pin is not an authorized version by Disney. Here is an example scrapper of Scar, from The Lion King. This pin was retrieved from a cast member during a recent visit at the Magic Kingdom in Orlando, Florida. In the picture, Scar’s mouth is yellow and he has a few black spots of paint near his nose. Additionally, his right eye seems to be bleeding with red paint, and his eye lids are not completely filled in. 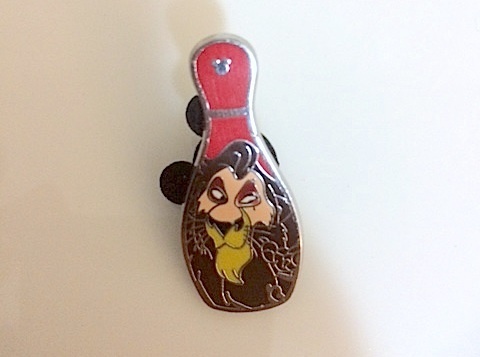 If you notice a pin with a character that looks off in color, it’s probably a fake. One way a pin makes it to the trash pile is by not having pupils. Because this is such a small detail, there are so many pupil-less pins in circulation. Check out this one small detail before you hand over your trading pin. In general, authorized Disney pins are metal. Some older pins (read: more valuable) are plastic. However, this is by far the exception, not the rule. This is why Disney’s official pin trading rules state only two metal backed pins with the ©Disney logo may be traded per cast member, per day. Most of the time, cast members catch pins that don’t meet up with these standards, so you’re not as likely to find a plastic backed pin with a cast member. While many pins are difficult to identify as fakes on their own, it can be fun to spot the fake among a set. 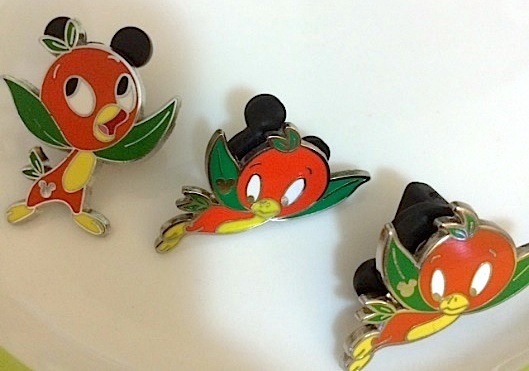 Here is a picture of three orange bird trading pins retrieved from a recent trip to Epcot in Orlando, Florida. Two of the pins are of the same variety, while the other bird is there for comparison purposes. It might be really difficult to pick out the fake on its own. But together, it’s clear the bird all the way on the right is the wrong color. It’s pupils aren’t dark like the others. Real trading pins are kind of expensive. While it’s possible to get great deals on them in variety packs or through other means, if another visitor is wearing a vest with hundreds upon hundreds of pins, be weary. Tell us in the comments about your pin collecting and trading experiences! June 5, 2015 at 9:31 AM · The fake pins are so pervasive, I find it best to make one of two choices. June 5, 2015 at 9:50 AM · I just don't understand any of this collecting of trinkets like this. I think there have been only a hand full of pins that I've liked. The only big issue I see is safety if the scrapers are using heavy leaded paint for example... Otherwise you should just enjoy your little engraved piece of metal. June 5, 2015 at 10:04 AM · This is why I buy (but don't trade) pins. I have several hundred but all came direct from disney parks. June 5, 2015 at 10:09 AM · This is a good list. One thing I'd add to #3 is the quality of the metal. Some of the most obvious scrappers are often the ones that- while metal- are light, thin, almost "tinny". I've been collecting pins for a long time, and the proliferation of scrappers in recent years has really changed the whole process. While I do think that some CMs will remove obvious scrappers, this often only happens overnight or after shift. I've never seen a CM refuse a pin, even an obvious fake. Guest experience & all, I guess. But this leads to two problems- first, by midday, so many lanyards are filled with inauthentic pins, and it's often not detectable until after you've made your trade. Second, I think it's contributed tremendously to the lack of new/interesting/different pins available for trade. Lanyards are loaded up backstage each morning with authentic pins, but they're the same, current, common duplicates you'll see all over each park throughout your whole visit. It's so hard to score a good find these days! The bottom line, though, is only trade for things that really appeal to you- scrapper or not, you have to like what you're getting. Don't go into it thinking you're going to find a rare piece. All of my pin trading experience has been in Walt Disney World. Someone recently told me that Disneyland CMs are a bit more discerning about what they'll take for trade. Does anyone know if this is true? June 5, 2015 at 10:40 AM · I considered buying Disney pins in bulk from Amazon or eBay, but I realize they are likely scrappers. For this reason alone, it is a bad idea to trade them. Just buy the good ones for your own enjoyment. Unfortunately, they are ridiculously expensive. They also serve no purpose if you don't display them. June 5, 2015 at 5:13 PM · I don't know about Disneyland but back in 2011 at Epcot we had to trade for any Disney pin fake or not as not to imply that the guests were trading fakes. So we traded fakes which were super obvious sometimes, and I don't think I heard anyone complain. They were just happy to get their "blue monorail pin" or whatever. The only people we could really go after and call security on or refuse to trade were the freaks that brought in the giant binders and hassled kids and other guests to trade. A lot of the problem I think are some of the tourist trap shops just off property that sell a lot of fake pins. An average customer isn't going to know, and if they can get their little metal pin there for 99 cents as opposed to 4 dollars why wouldn't they. June 6, 2015 at 6:42 AM · I was taught by a CM to do a magnet test if it holds to the magnet it's a fake. This does not always work because now even the official Disney pins are using cheaper metals that hold. Pins are like beanie babies they have no value at all. Sets cannot be easily completed and they keep making more and more but at $10 or more a pin their profit margin has to be huge. June 7, 2015 at 12:19 PM · The picture of Huckleberry Hound should have been a hint. Darn! June 8, 2015 at 5:36 PM · Thank you for sharing. As a current cast member I get so many fake pins from guests. Most of the time if I can't tell if a pin is fake or not therefore I usually throw them out.